A forum to discuss the REDEEM (Record Expungement Designed to Enhance Employment) ACT, which is criminal justice reform legislation structured to give Americans convicted of non-violent crimes a way to seal their criminal records, was recently held at Sullivan University’s College of Pharmacy and featured Senators Rand Paul (R-KY) and Cory Booker (D-NJ), whom joined the discussion via videoconference. Video of their remarks can be found here: http://www.youtube.com/watch?v=X5JqfLg22BM. Louisville-based Trinity Video Communications partnered with event organizers to ensure the proper systems, software and support was in-place to create a secure and reliable video connection. “Our team was honored to be a part of such an important event, especially one where a seamless, secure and reliable video connection was needed, which is our specialty,” says Barry Sawayer, CEO at Trinity Video Communications. “We’re extremely pleased both Senators were able to provide their perspective on this topic without interruption, which was our ultimate goal,” said Sawayer. Trinity Video Communications develops audiovisual and video communications solutions for higher education institutions like Sullivan University, as well as healthcare organizations, major corporations and the federal government to transform the way they communicate, interact and do business. Trinity also provides real-time unified communications to law enforcement agencies at the federal, state and local levels responsible for mission critical initiatives. For more information, contact Trinity Video Communications at 1-800-261-9008 . The REDEEM Act was first introduced last year. Sens. 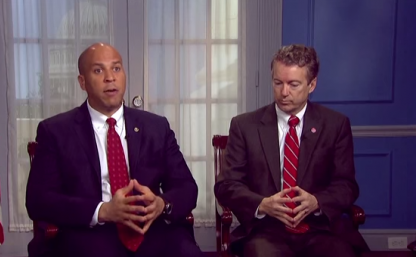 Paul and Booker intend to re-introduce the legislation in 2015 and bring it to a vote in the Senate. The original press release outlining the REDEEM Act can be found here: http://www.paul.senate.gov/?p=press_release&id=1192.